A Ketogenic nutrition lifestyle is a high-fat, adequate-protein, low-carbohydrate diet that forces the body to burn fats rather than carbohydrates. Being fully Keto does fabulous healthy things for your body. I cannot make medical claims but let me tell you my experience with Keto. MOST importantly — and the reason I started Keto — was that my fasting insulin was dangerously high at 46.5! Now my fasting insulin has gone down to 12 (at the latest measurement), which means my insulin resistance is being healed and my diagnosis of metabolic syndrome no longer exists. (A normal fasting insulin level is less than 5!) My A1C went from 6.1 to 5.2 – I am no longer considered pre-diabetic. My triglycerides and overall cholesterol have gone down and my inflammation markers (the true cause of heart disease, arthritis, and more) are coming down. Once suspected of having fatty liver disease, I no longer have that worry. My blood pressure, which was never a problem anyway, has been reduced to the point where the nurse usually takes it twice to make sure! Oh! And I almost forgot: I lost weight! I realize, however, that some people like to dip their toe in the pool, rather than jump in the deep end. If going slowly is your preference, my Granny Keto Transitions Program™: Five Steps to Keto program is for you. The steps I've outlined on this page will give you a starting point to either start on your own or to work with me as your coach at each step – especially if your ultimate goal is the full health that eating in a Ketogenic way will offer you. If you are totally new to, or unfamiliar with, the Ketogenic lifestyle, please take a look at my article, What is Keto and how do I get started with it? You'll see the progression of steps needed for transitioning to a full Keto lifestyle. Please also sign up for my free guide, "Dancing with Keto" to learn to be finally free of weighing, measuring and tracking every morsel of food you eat! Looking For guidance at Specific Steps? Maybe your metabolism is fine and you are not even the slightest overweight, but you have a sugar demon that you cannot get off your back. Maybe you have a child or family member with diabetes and you want to be a good role model and show that there is indeed life without sugar. Maybe you have tried over and over again to lose weight but always went back to old eating habits and weight gain. This program will teach you that it is the food itself that causes cravings and overeating. Maybe you or someone in your family needs to eat gluten-free (or totally grain-free) and you would like guidance as to how your meals and shopping lists need to change to accommodate this. Maybe you have fine control with sugar, grains and baked goods, but you want some counseling on how to incorporate more low-carb eating into your lifestyle. Maybe you have done your research and you are ready to begin Keto, but you don’t know where or how to begin. 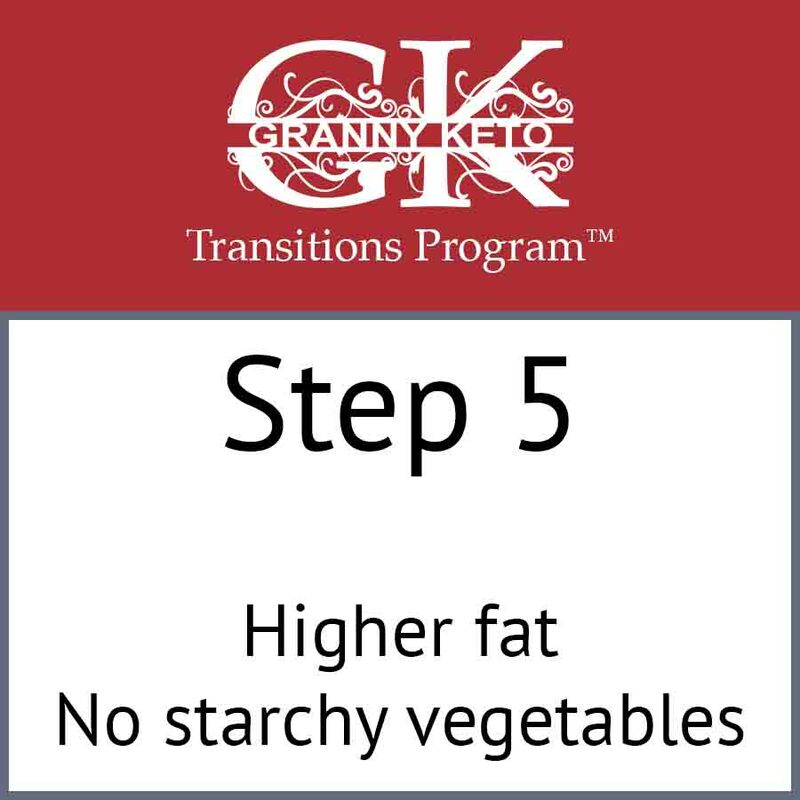 Going back a few steps into the Granny Keto Transitions Program™ might be just what you need! On this page, you'll find a bird’s eye view of the steps in the Granny Keto Transitions Program™. When you sign up for coaching in the Granny Keto Transitions Program™, you receive the full set of materials that accompany each step. You can work all steps starting anywhere on the staircase or just go as far as you want to go! I meet you where you are and guide you to where YOU want to go! If you have a spouse or an entire family to shop and cook for, I will give you the guidance you need! I also offer friends and family group coaching if that will be of further help to you. I put these two together because, although you might be able to give up your sugar fixes, it does you no good if you then eat a loaf of bread or a sugar-free pastry. I am also starting you here with having no "outright" sugar (i.e., sugar in your coffee, candy, honey in your tea, etc.) but please be aware that fruit is fructose and the fiber in it does not mitigate that fact. Yes, juice hits your bloodstream faster than a whole fruit because of the fiber, but a whole fruit is still mainly fructose and fructose is sugar. At the very least, please limit your fruits to one or two servings a day; an entire fruit bowl is not a good alternative to a candy bar! This first step requires awareness. Did you know that there are many names for hidden sugar and the list is added to yearly? I am sure that you know that High Fructose Corn Syrup (HFCS) is one of them but as you start to read labels (that is ESSENTIAL at this step!) you will learn to identify them easily. Okay ladies and gentlemen – hold on to your hats. This is the biggest step after getting the sugar out of your diet. You must keep Step 1 intact if you are moving towards a Keto lifestyle. If you are looking to stay here for a while and eat more of a Paleo or Primal diet, you are allowed honey back into your diet as the ONLY sugar. However, be forewarned – something like a Paleo banana bread made with honey and bananas not only is dangerous for insulin levels and sugar cravings, but does not help you at all if your ultimate goal is full Keto. As you educated yourself on hidden sugars, you must become educated about grains. Most of you would recognize wheat, corn and barley as grains but there are many more. Also included in this list are "pseudograins" that come from the seeds of broadleaf plants and not the thin-leaf cereal plants. These grains do not contain gluten, so if your main goal is to be Paleo or just gluten-free, these grains (and rice) are okay at this Transitions step. However, because of their carbohydrate count, they are not allowed on Keto, where your total carbohydrates for the day come to less than how many are in one cup of rice! Also, these grains still have inflammatory properties so if you are on a mission to heal your gut, I urge you to not eat anything from this list, whether or not you ever transition to full Keto. This might be a great step for you to land on and stay a while. This is the step where you will become aware of the carbohydrate counts of fruits, vegetables, dairy, nuts, grains and legumes. The standard American diet (known as SAD) can be 300–400 or more carbohydrates a day even if you do not overeat or binge. These carbohydrates add up — one meal will usually have 100 or more! For example, a moderate typical breakfast consists of: 8 oz juice with 27 carbs; 1 cup multi-grain cheerios with 24 carbs; small sliced banana with 24 carbs; 1 cup 2% milk with 12 carbs; coffee with 2 tablespoons creamer with 10 carbs. That moderate breakfast totals 97 carbs. Want to add a Starbucks or Dunkin' Donuts coffee drink to that on the way to work? Depending upon whether you use a flavoring and/or sugar, it can add up to another 40 carbs for a small one. Add ONE multi-grain bagel — nothing even on it and you've added 63 carbs! Okay, forget the Starbucks coffee drink and maybe the bagel. What are things you might pick up as a snack or to add to your meal during the day? Think you are "good" to get just a snack bag of BAKED Lays potato chips? Add 31 carbs right there for only 15 chips – and that is probably only ½ a snack bag. Think a handful of grapes (about 1 cup) is better? Well maybe – that’s only 29 carbs. Lunch? Boy, you’re being good here – you brought a Lean Cuisine to heat up at work: Sesame Chicken? 51 carbs; Glazed Turkey Tenderloins? 44 carbs; Lasagna with Meat Sauce? 45 carbs; Parmesan Crusted Fish? 42 carbs. AND let me add, as a former Lean Cuisine and Weight Watchers frozen meal sort of gal – you are STARVING within an hour, so let's add fruit, salad, maybe popcorn or pretzels, etc. Haven’t switched to diet soda to go with that Lean Cuisine? A can of Coke is 40 carbs. You get the point here – by the time your day is done with three meals and two to three snacks, you are easily looking at 300–400 carbs or more. I spared you from going through a dinner menu that might include a baked potato, pasta, bread, a casserole that might have breading, etc. but you get the point from what goes on at breakfast and lunch. I would have started Keto six months sooner than I did if I did not hear "No fruit except for berries." I said, "No way am I ever giving up fruit. Are they crazy?" But then I started learning and opening my mind and accepting the truth. There are a few issues with fruit. Let's just start with the pure sugar and carb content of fruits. If you are going to be full Keto you will be restricting your carbohydrates. However, there is a more serious concern with fruit that goes beyond counting carbohydrates. Fructose, the sugar in fruit, cannot be used by your cells for energy. Fructose goes directly to the liver to be metabolized and can cause a fatty liver which is linked to early death, diabetes and heart disease. Fructose also makes you more insulin resistant, makes your triglycerides go up, increases inflammation and has a terrible effect on your cholesterol. Berries in moderation (about ¾ cup) not only have much less sugar but their glycemic load is also low, meaning they will very slowly raise, if at all, a person's blood glucose level. In terms of moderating protein, that was the second biggest challenge for me (even more than giving up bread and pasta!). Proteins are the building blocks of cells and muscles and it is essential for brain function and other essential functions such as to heal cuts and wounds. However, the body "recycles" much of its proteins and you do not need to consume large quantities to have a health body. In fact, by a process called gluconeogenesis, the liver can turn too much unused protein into glucose, thus spiking insulin. In Step 4 you will be encouraged to eliminate fruits except for berries and to learn how to moderate your protein intake in healthy and creative ways. This step is the springboard to the final Transitions step that will get you to your goal of full Keto. And never fear, there are ways to recreate fruit flavors with a world of extracts, and you can still enjoy fresh lemon and lime juice in your beverages. You have arrived at the final step of going Full Keto. CONGRATULATIONS!! In this step you will have the final piece of the puzzle – eating higher fat and eliminating starchy vegetables. The MYTH (known as the Diet-Heart hypothesis) is that fats (especially saturated fats) are bad for you. As a matter of fact, they serve very important functions such as building cell walls and assisting with mineral absorption and conversion. For instance, the fat-soluble vitamins A, D, E, and K are called fat soluble for a reason! If you eat low fat or no fat, you don't get the full nutrients of these vitamins. Furthermore, fat is the one macronutrient that has no effect on your insulin, so it is the perfect food to add to your meals for satiety, flavor, and enjoyment. The takeaway is to not skimp on real fats! This step will walk you through adding fats to your meal and will also give you the complete picture of your "macros" so that you can understand the proportions of each macronutrient as you eat a well-formulated Ketogenic diet. Because now you understand that you can find satiety and satisfaction with fat, it is the perfect time to take those potatoes, carrots and other starchy and sweet vegetables off your plate. You are ready now for FULL KETO! You are now at full Keto, eating a a high-fat, adequate-protein, low-carbohydrate diet that forces the body to burn fats rather than carbohydrates. Eating this way makes the liver convert fat into fatty acids and ketone bodies. An elevated level of ketone bodies in the blood is a state known as ketosis. This is not the same as ketoacidosis, and as long as your body produces even a minute bit of insulin this will never happen to you (it is a dangerous state in a Type I diabetic but can be avoided). The Ketogenic diet was first used to treat difficult to control epilepsy in children, and the nutritional Ketogenic diet most people use is not as severe as the medical Ketogenic diet, which has a ratio of 4:1 fat to combined protein and extremely low carbohydrates. If you say, "I’m eating Keto," it generally means the nutritional Ketogenic diet. And you've become a fat burner instead of a sugar burner! The biggest shift you will have to make – beyond what foods you are eating – is your mindset. Going Keto is an entire paradigm shift, not a diet. You have to have a strong enough WHY to see you through this. You need to do this for health! You will lose weight, of course, but this is a whole new way of eating for you, and you must be able to sustain it. That is where your WHY comes in. Read what my WHY is here. It's so important to find your WHY because it will strengthen your commitment. I am not saying you have to be strong because going Keto is difficult (actually it will become easier and easier, I promise). I am saying you have to stay strong because health is a lifetime commitment. This is where coaching is so valuable. Yes, you may still need help with the bones of Keto (eat-this-not-that type of thing or helping you plan family meals, outings, work lunches, etc.). But the most helpful thing about working with a coach is that you will have someone to help you wrap your mind around this paradigm shift and to remind you that you are worth it. You are worth the hard work and the health that it brings, and I will be your support no matter what else is going on around you. Keto is a wonderful way to bring your body and your mind in alignment with health. I want that for you and for anyone who has signed up for Transitions. GOOD LUCK!